ALBs are originally from Asia and have caused the death of hundreds of thousands of trees across the nation, particularly in maple trees in New York City, on Long Island, in New Jersey, Chicago, Illinois, Worcester, Massachusetts and Clermont, Ohio. 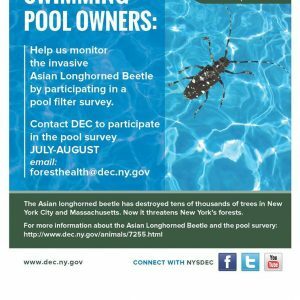 DEC’s Forest Health Program developed a simple and easy survey to track ALBs for homeowners who have swimming pools and are willing to keep an eye out for these insects. 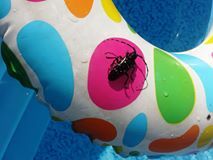 Pool monitoring offers a simple, economical alternative to traditional procedures for surveying ALBs in the state. It also has the potential to become New York’s most effective method for detecting ALBs. In addition, this monitoring program gives residents the ability to take an active role in protecting trees in their yards, communities and forests. With citizens involved in looking for this pest, there is a better chance of finding new infestations early, helping DEC and other state and federal agencies focus their efforts to eliminate infestations.